Curious about how social Europe is perceived in the media? The EUvisions observatory is the place to look! A new section is available on the website. It is called Ideas Monitor, and it presents regular overviews of the public intellectual debate on social Europe, as it emerges from traditional media outlets, such as newspapers and magazines, as well as online publications and the wider blogosphere. More new sections will soon be available on the EUvisions observatory, stay tuned! Ieri a Strasburgo si sono incontrate, e in parte scontrate, due diverse Europe: quella delle istituzioni sovranazionali (il padrone di casa era il Parlamento) e quella degli Stati membri. Hollande e Merkel hanno parlato di questioni che riguardano tutti, avendo però in mente le priorità e gli interessi dei loro due Paesi... Merkel e Hollande, l’occasione perduta dell’Europa is out on Il Corriere della Sera. Read ithere. Two new nwespaper articles on the crisis and the EU by Maurizio Ferrera are available on his website: Cari intellettuali, sull’Unione siete ingenui e poco ambiziosi and Un leader e un patto politico per un’Europa «all’americana», both issued on Il Corriere della Sera. Read the latest essay by Maurizio Ferrera Partiti, rappresentanza, Europa on "Il Mulino". 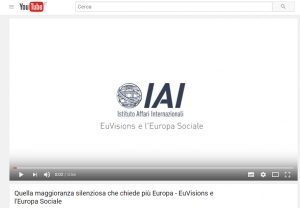 A discussion between Maurizio Ferrera, EUI Alumnus and Professor of Political Science at the State University of Milan and Professor Brigid Laffan, director of the Robert Schuman Centre for Advanced studies. Together they explore the existing tensions between two of the continent’s crowning achievements, the European Union and the welfare state and how each was affected by the recent economic crisis.